With the growing interest in the magical world, we’ve had a lot of folks coming and looking forward to a big host of magical gear to help them accentuate their daily lives… or even their nightly ones. Thing is… magic is rather hard to come by and it is a full time job just trying to fill up a single bottle of arcane powder. So, we have to turn to the wizards to get things moving and see if we cannot get the rest of the magical creatures to creep back into activity. Now, we understand that the life of a wizard is very busy and it is a rather insolent request to have you come out of your towers and put away your books and spell research material… but this is for the good of the whole magical world! To help convince you to join our cause, we’ve put together a pretty handy set of accessories that was inspired by the grandest wizard of them all! 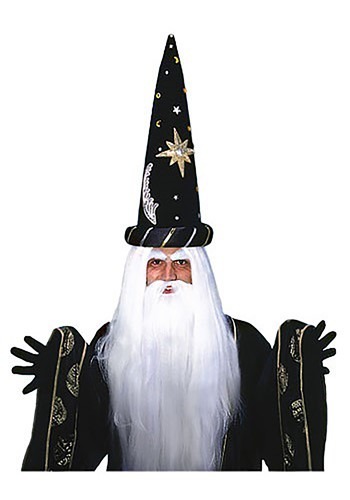 Up your magical mojo with this Merlin Wig and Beard set! This polyester long white wig and matching beard are perfect for all your wizarding needs, whether you want to go down the road of Merlin, himself, or take a more casual Gandalf approach. Heck, we’d even take old nutso Sarumon if it meant filling the arcane quota! Just remember to point your wand that way!